As this was my friend’s first trip to New Orleans I let her select most of our activities. One thing on her list was a swamp tour. I admit I was not overly excited about the prospect but it was something I’d never done so I was game. Based on reviews on Trip Advisor, we selected Airboat Adventures, in part because they would pick us up from our downtown hotel. It’s a $20 charge per person for the ride so while it made sense for us, if you have a larger group it may not. There was a family of four on our boat who’d used Uber to get to Airboat Adventures but cell service is not strong AT ALL at their office and they were having trouble reaching Uber to get a ride back. I don’t know how it turned out but it could be quite costly if you haven’t made prior arrangements for the return trip. As our visit was in late August, we opted for the 9:45 AM tour, hoping to finish before the heat of the day. We were fortunate in that it was a partly cloudy day which helped to keep us from baking. The airboats have no covering so you are completely exposed during the tour. We slathered up with sunscreen and I was concerned about biting insects (they really like me) but I did not have any issues with that. 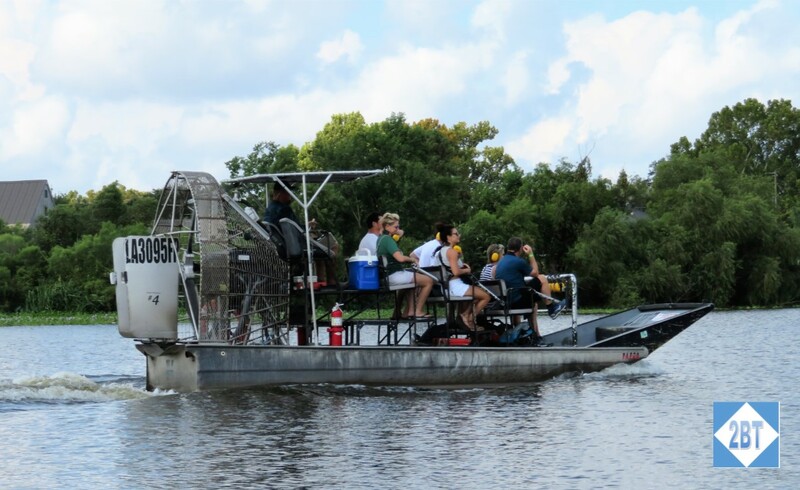 Airboat Adventures offers three types of boats: smaller airboats that seat 5-8 people, larger ones that can hold up to 36 and covered pontoon boats which appeared to be able to hold about 50 people. Obviously the smaller the boat the more it can maneuver into side channels of the bayou (as it’s know locally). The fewer people the boat holds, the more expensive it is per person. The bus picked us up at our hotel at 8:30 AM and there were two other stops, with one being just around the corner at the Hyatt Regency. We arrived about 9:20-9:30, in time to check in and pay. While tickets can be purchased with a credit card, items from the gift shop must be paid with cash. 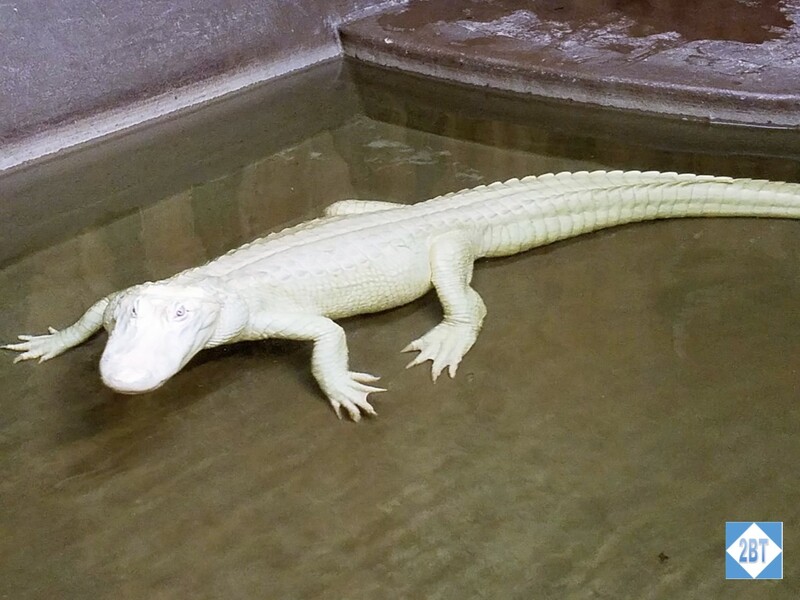 In one corner of the gift shop was this albino alligator. While their life expectancy is quite short in the wild, they do very well in captivity since there are no predators. Still, I felt bad for this girl as her pond was very small (though immaculate) and thought she probably needed more stimulation and enrichment activities. We had paid for the cheaper large boat tour and were fortunate that it was perhaps only half full. That gave everyone room to spread out a little yet we could still see to either side. 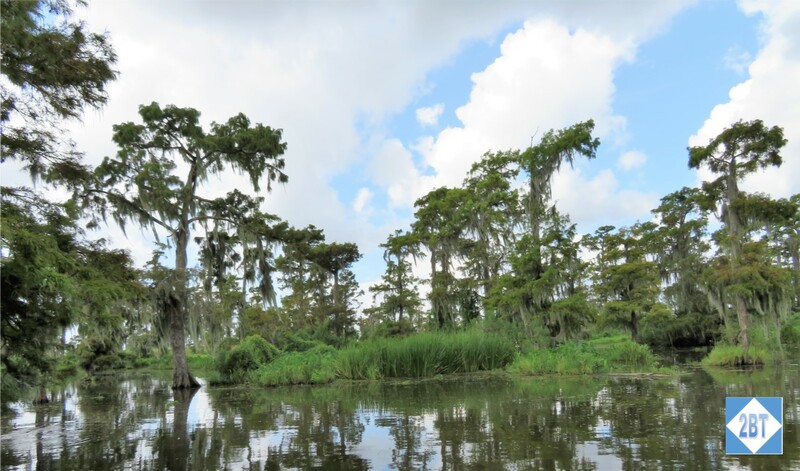 The bayou has several different landscapes, all of them dramatic. 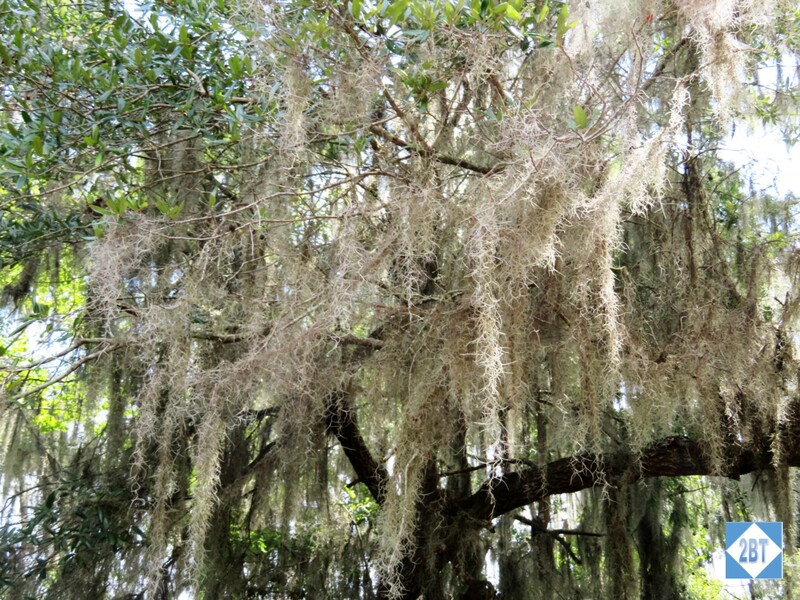 Spanish moss covered trees throughout our tour. From a distance it’s somewhat ghostly. Up close it’s more reminiscent of cobwebs. 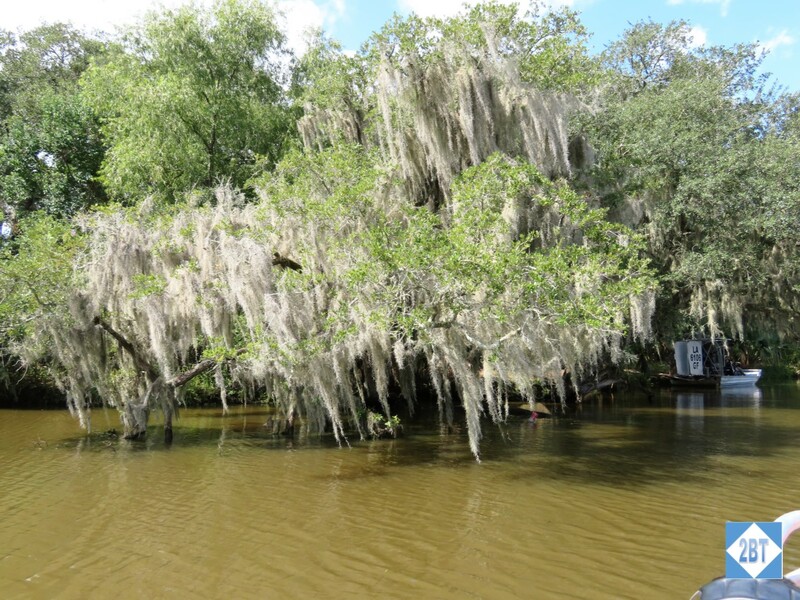 We visited several small coves where we saw alligators up close and personal. The guides have discovered that gators like marshmallows – or “swamp crack” as they call them – so they’ll lure the gators up close to the boat by creating a path with the candy. Gators have terrible peripheral vision so when one of the gators turned to leave, our captain actually leaned down and put a marshmallow on his head! 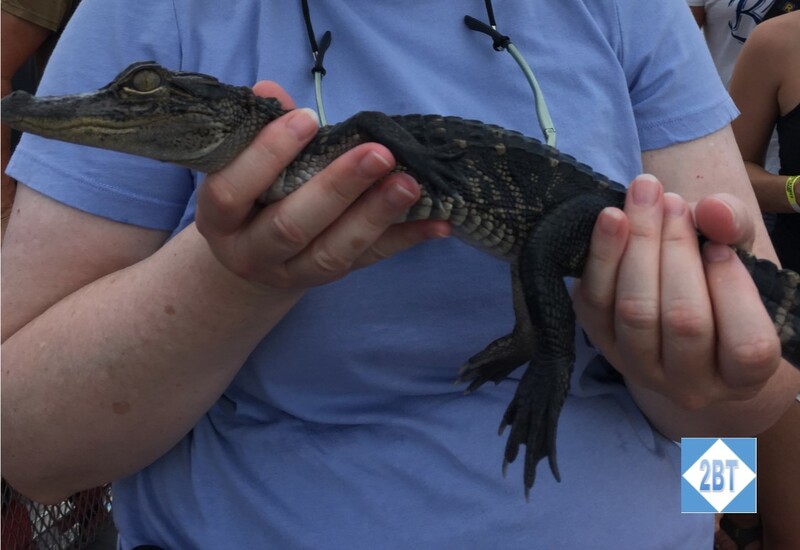 Our biggest surprise came during a stop when our captain reached into his cooler (turned out it had some water in it) and pulled out a two-year-old gator. He had raised it from the time it hatched and since it was accustomed to being handled, it was really fairly docile when held properly. The captain would lay the gator along his forearm with his fingers in front of his legs but behind his head and stroke the little fella. The gator loved this and you could see him relaxing. But then he offered to pass the gator around and boy was that cool! I was really surprised at how rubbery his skin was. I suppose it gets more armor-like once he gets full grown. My new pet! I emailed family members that I was bringing him home and some actually believed me! You can guess a gator’s age by (virtually) measuring the distance between his nostrils and his eyes. On this guy that distance was about 2 inches, corresponding to his age. Our captain planned to release him into the wild in a month or two. 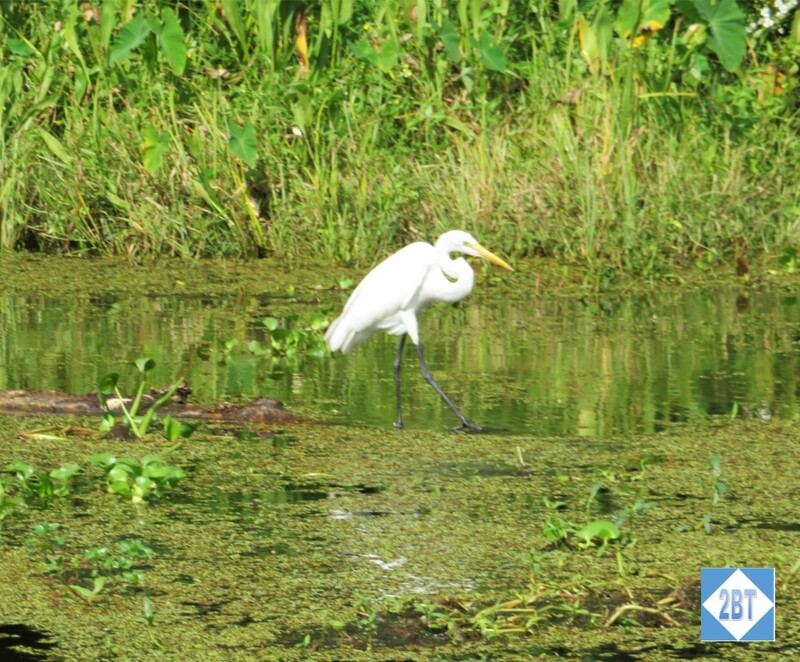 Though gators are the deadliest residents of the swamp, excuse me, bayou, there are other creatures there including white herons. This turned out to be more fun than I initially expected and I’m glad I went. I can highly recommend Airboat Adventures if you want to take an airboat tour during your New Orleans visit.